Hi, friends! 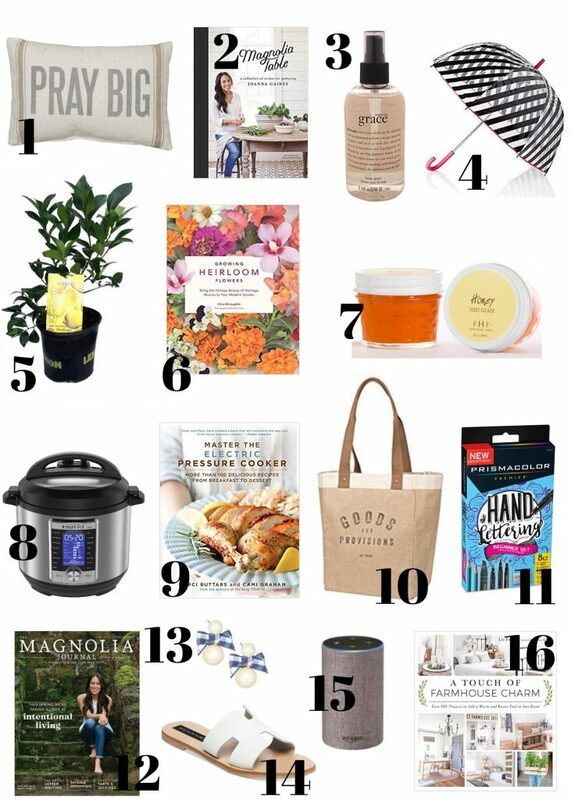 Mother’s Day is just a few days away and I thought I’d gather together some last minute Mother’s Day gift ideas that you can order on Amazon and get in time for Mother’s Day! I love to shop, but more and more, I find myself ordering things online and especially via Amazon. You really can’t beat the convenience and it is such a time saver!!! And, I know there have to be some people like me who wait until the last minute to find the perfect gift! My picks are things that I either own or things on my wish list! Everything is under $100 too! Take a look around and maybe you’ll find something for your Mom, grandmother, special aunt, or even something for you! *This post contains affiliate links for your convenience. Please see my full disclosure at the bottom left of this page. Pray Big Pillow Cover – Primitives by Kathy is a local Lancaster County business and I love to support them! This pillow cover looks like an antique grainsack and is only $15! Magnolia Table Cookbook – How could I not include this! The recipe for Joanna’s biscuits that we had at Magnolia Table is in the cookbook!!! Amazing Grace Body Oil Mist – Have you tried the Amazing Grace scents from Philosophy? If not, you should! Amazing Grace is a soft, clean scent that almost everyone loves and this body mist is moisturizing to boot! Kate Spade Striped Umbrella – Love Kate Spade and this umbrella is adorable! Who doesn’t need a good umbrella in the spring? Meyer Lemon Tree. A few years ago, who would have thought you could mail order a plant, but you can!!! I’ve always wanted a Meyer Lemon Tree and this one has great reviews! Growing Heirloom Flowers. Heirloom flowers are my favorite. They bring back memories of my grandmother and aunt’s flower gardens! FarmHouse Fresh Honey Heel Glaze. I just stumbled across this brand and can’t wait to order! The reviews are amazing and it’s a 2016 Southern Living 2016 Beauty Award winner. The Fresh Honey Heel Glaze sounds like what every woman needs for dry heels and who doesn’t have those in the summertime!!! Instant Pot. Okay, this one is practical, but who doesn’t want a time-saving way to cook in the summertime, or any time for that matter! Master the Electric Pressure Cooker. If you get an Instant Pot, I would recommend this cookbook to go with it! It’s written by my blogging friend Cami from the blog Tidbits! Goods and Provisions Tote. I have this tote and it’s exactly like the totes used at Magnolia Market, except it doesn’t say Magnolia Market – of course! The ones at Magnolia Market sell for $58! This one is under $24! Prismacolor Hand Lettering Beginner Set. Want to learn hand lettering? This set looks great and the price is right at about $10! Subscription to Magnolia Journal. A beautiful magazine! Kate Spade Studs Pretty Pearly Stud Earrings. Aren’t these earrings charming with their buffalo check bows!!! They come in navy or red check! Kate – could you make them in black too??? Steve Madden Greece Flat Sandal. These sandals are on my wish list for summer! I love the classic style and they come in many colors! My fave is the white! Amazon Echo. The Echo products are on sale right now and this is another item on my wish list! This is the second generation Echo and it comes in several style options! A Touch of Farmhouse Charm. This is a great book for any lover of farmhouse decor! It’s written by my blogging friend, Liz Fourez of the blog, Love Grows Wild. There are some amazing and easy farmhouse DIY projects in this book! Liz is so creative and if you don’t follow her blog, you need to! I hope you liked these Mother’s Day Gift Ideas. And, that you found something you like for your Mom, special lady in your life, or your own wish list! I’ll be back tomorrow with more about my trip to Texas and then later this week I’ll be sharing a spring bedroom refresh that features an old-fashioned spring flower! All great suggestions. Wish I lived in warmer climate for lemon trees.